People preferred to go for the refurbished cell phone to save money while shopping smartphones. This buying guide will guide you to buy refurbished smartphones in a smart way and how not to get fooled while buying second hand or old cell phones or refurbished mobile devices which were faulty before fixing them. These refurbished phones are ready-made cell phones and off course, they have unboxed mobile handsets, rather they are mostly returned by customers because of small defects, and standard manufacturers already fixed those minor faults. But there are many important things and precautions you need to think before buying refurbished smartphones. We have discussed Top 35 Best Android Tips, Tricks & Hacks That Will Blow Your Mind // Smartphone Tricks. But today we are going to talk extremely important things you need to think, notice and focus on buying used or refurbished mobile phone. Refurbished products are resold items which have been returned to the company due to several functionality problems or various reasons, but they have fixed and already have reset to its original specifications or in other case, the refurbished cell phones may also be returned or donated from the customer to company or customer care center to make ready for resale. Manufacturer Refurbished Phones are REALLY GOOD? The manufacturer refurbished phones are factory refurbished phones type. These are reliable devices because the company that makes the phone is the one who can fix it. These phones have been restored by the official manufacturer to get the proper working order & manufacture will to provides the warranty; so at the end, it's a good decision to buy refurbished phones by manufacturers that those usually intent on buying from a local service center. Whenever we look for refurbished mobile phones, never forget to make sure that, there is no previous info/ data or any mark out of the previous owner in the settings or in the account section of that device. It must be factory reset. The device memory should be fresh or wiped off clean so that you can set your phone as per your preference. If you found any info stored on the phone, it is the sign of that your phone is not refurbished, and it's not safe to buy. Most of the well-known companies offer a warranty but note that the warranty and return policy will not be the same as the policies offered on the new phones. If the refurbished phone does not include a warranty, think twice while purchasing it. Check that exactly what the phone is covered for and under what circumstances they can returned back to the seller. Every mobile has the ESN Number [Electronic Serial Number] under the battery of the mobile, which is unique no. for each mobile handset. By this number, the manufacturer will be able to provide details on previous ownership. Everything about the phone can be identified by this unique ESN number. Most people buy refurbished mobiles due to its low price. Never buy any refurbished mobile at the same price of the new mobile you probably go for a new unboxed mobile. The price depends on the reason for refurbishment so the mobile that offers too low price may not function & work properly. a. Standard: this type of refurbishment occurs at the distributor level like service provider & they complete a repair of some kind & usually not returned to the company for refurbishment. They are moderately expensive refurbished mobile phones. b. Factory: these types of mobile phones are refurbished by the manufacturer. This is most preferred refurbished mobiles & they usually provide the warranty which covers the repair and replacements if required. These are most expensive refurbished phones. c. Reseller: these mobile phones are either repaired by the previous owner or by the business associates who fixes the mobiles. These mobile devices are least expensive but don’t provide any warranty. The quality and security of refurbished mobile phones come in the order of factory >> standard >> resellers. So I mostly recommend you to go for the factory refurbished mobiles. If your phone is LOCKED (mostly its preferred as network locked), then it will accept only particular network provider & if it is unlocked, then it will work with any service provider. Before buying the refurbished handset, get ensure with your network provider that there will not be any problems to activate the phone after purchasing as because many mobile handsets do not support with the network service from certain networks. So while buying any refurbished mobile make sure that this network lock point is checked. Always purchase refurbished cell phones only from well-known manufacturers. Verify the details such as a prior seller, purchase history & current status of the mobile device. If such details are not available, then you must reconsider your purchase because any reputed seller would keep this info. Try to check all the necessary accessories such as the battery charger, charging ports, etc. the wrong fit could result in permanent damage, that will not be able to continue a full charge may cause issues with syncing with your PC. Check whether the phone was refurbished due to physical problems like by damage to the casing, broken screen, or due to the software problems or hiccups in programming. Just be careful about this. 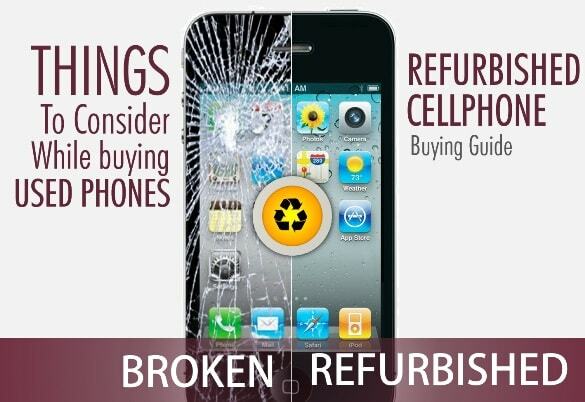 Knowing exactly what has been restore & repaired helps you to buy refurbished phone confidently. The main difference between refurbished & used mobile devices; is that the refurbished phones are tested for functionality & defects while used phones may not be tested. Buying the refurbished phones is a good deal than the buying a second hand used phones. There are many positive points such as low price, eco-friendly advantage, & ready availability of phones. But just note that; it makes a good deal only when you examine the warranty, price comparison & a return policy along with the current condition of the refurbished mobile phone.